Lines from Linderhof: A Garden Luncheon -- Inside! 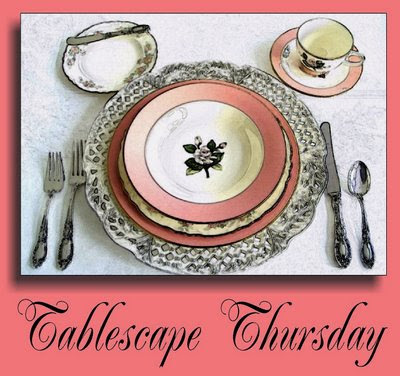 It's Thursday and time for the wonderful tablescapes that you'll find at Susan's, Between Naps on the Porch. It's always fun to see the creative tablescapes each week. Wednesday we had a garden luncheon at Linderhof -- but because of threat of rain it was INSIDE!!!! 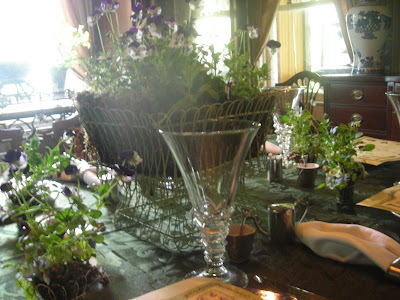 But the table did say "garden" whether it was outside or inside in the breakfast room or the dining room. With six guests, alas, if we couldn't have it outside, it had to be in the dining room rather than the breakfast room which overlooks the garden. I always do a menu for each guest -- this particular menu was also the placecard -- for each had the name of the guest on the menu. And at each place, a wee wire basket, lined with moss and filled with violas. Silver salt and pepper shakers -- the pepper in a "watering can" and the salt in a garden pail. Bought several years ago from Smith and Hawken (at a ridiculous price but I had to have them) just for garden dining. 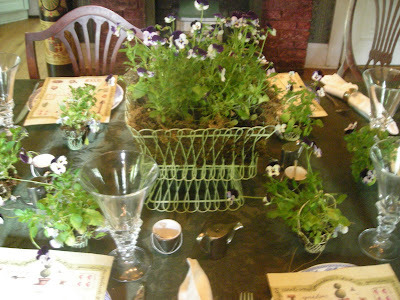 The centerpiece, two French wire baskets -- turned on top of one another and also lined with moss and filled with the same violas. The cloth, a dark green which seems like a garden. The dishes are my blue and white Spode which are peeking out from under the menu. White napkins in my silver napkin rings. The menu for the luncheon? Chicken Dijon, Salad of garden greens, roasted cherry tomatoes, Farmer's market radishes with Linderhof vinaigrette and a rhubarb strawberry crisp (served warm) for dessert along with coffee. Everyone had a grand time and they lingered over lunch as lunch should be lingered over. OOO, so pretty. I love the wire baskets and your cute salt and pepper shakers! Those are the most adorable little baskets! I would have had to have them too! 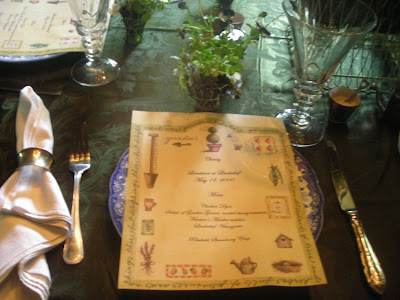 You always amaze me with the tablescapes and menus you come up with, a regular Martha Stewart! P.S. Oliver is such a cutie! Tasha Tudor always had Corgi's you know! ooh, I want a house like yours! Yes, I agree--you did HAVE to have the salt and pepper shakers! Your menu sounds wonderful. I love radishes. Rhubarb is not something I am familiar with--may have to give it a try! I know your guests enjoyed this. Well you had a very pretty garden party - even if it WAS inside. Oh I love it........it looks so beautiful Martha. What a beautiful home in your blog header! Martha, what an enjoyable luncheon this must have been for all. 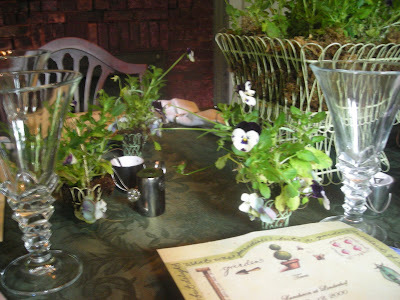 Just love all your ideas, the salt and pepper shakers, the tiny flower arrangements at each setting and the menu. Lovely! I love all the extra touches you did. How wonderful to use all the natural foliage! Cheers! Martha, you do set such a gorgeous table. This looks so inviting. Pretty setting... love the use of a menu! Beautiful tablescape and garden theme. I can see why you had to have those salt and pepper shakers. Your tables are always so lovely. It is a joy to look at them! Beautiful tablesetting as always Martha. Your menu sounded fabulous as well and I love those wire baskets. I have those same S&P's as you know but haven't used them yet. Wish I had gotten two sets??? I love your tablescapes....they are always so magical. I adore those wee wire baskits with violas. Every table you set is beautiful! I love your Mothers Day chair and it looks so perfect in your bedroom by the fireplace. Your little (Vanna White) looks very content without a care in the world, silly doggie. I love the menu! Thanks for the idea. I also liked how you served your salt and pepper. Very creative and beautiful setting! 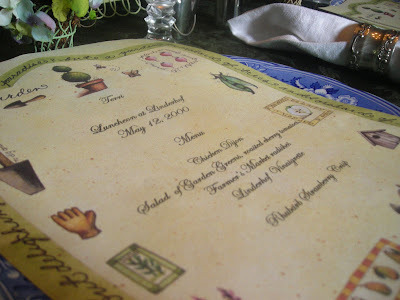 I adore the greenery on the table and adding the extra touch with the menu, great idea. . . I would love to be a guest at your table. It is always so pretty and inviting. Loved everything about it! And what a table to linger 'round. Peace as a Spring day in the garden. Too cute on the S&P. Once again I want to have lunch at your house with the pretty table and the delicous menu. Lovely garden table, Martha! Hope you enjoyed your friends! What a pretty table, Martha! I love your stemware. The menus are a wonderful idea! I love the little baskets of violas, too. Perfect!